I have been asked by many people, what are the steps to becoming a student or practitioner of Nichiren Shu Buddhism at 長栄山円教寺 Choeizan Enkyoji Temple? This process is described in detail below. If you have any questions, please do not hesitate to contact me. Please note that traditions and practices described apply to 長栄山円教寺 Choeizan Enkyoji Nichiren Buddhist Temple of Seattle and may be different at other Nichiren Shu temples and Sanghas. Please check with your home temple and teacher as to what their process is. This is a very simple ceremony that has been handed down from the Buddha to his followers. It signifies that the lay person has become the priest’s disciple and hence a member of the local Buddhist Sangha. In all Buddhist lineages this is the basic act of following and studying formally the Buddha’s teaching and becoming a member of the community. Taking refuge is the affirmation that you want to become a Buddhist, and that you accept (or reaffirm) the Buddha as the perfect enlightened teacher; the Dharma as the guide to the spiritual path; and the Sangha as the supporting spiritual community. These three are also known as the Triple Gems. Taking the refuge ceremony has been compared to taking baptism and confirmation together. The ceremony is offered several times a year at important events, and it may be done on other occasions if a member with deep sincerity makes a request to the head priest. Afterwards each participant receives a refuge certificate stamped and signed by the priest conferring the refuge ceremony. It is to be kept the in the family butsudan as a record of this important event. This ceremony is open to all who wish to participate. • I take refuge in the Eternal Buddha, wishing all sentient beings to understand the great Doctrine and make the superlative resolve. • I take refuge in the Dharma, wishing all sentient beings to penetrate the Lotus Sutra with wisdom as unfathomable as the ocean. • I take refuge in the Sangha, as shown by our founder Nichiren Shonin, wishing all sentient beings to harmonize the multitudes in general, without any obstruction whatsoever, and to respect the sacred Sangha. If we look at our lives, we may not see ourselves exposed to any imminent personal danger. Our jobs may be steady, our health good, our families well-provided for, our resources adequate, and we think that all this gives us sufficient reason to believe ourselves secure. Thus seeking refuge seems entirely superfluous. To understand the need for a refuge, we must learn to be aware of our position as it really is; seeing it accurately and against its total background. From the Buddhist perspective, the human situation is similar to an iceberg: a small fraction of its mass appears above the surface, the vast mass remains hidden below. Owing to the limits of our mental vision, our insight fails to penetrate beneath the surface, to see our situation in the underlying depths. But there is no need to speak of what we cannot see; even what is immediately visible to us we rarely perceive with accuracy. The Buddha taught that cognition is subservient to wish. In subtle ways concealed from ourselves, our desires condition our perceptions, twisting things to fit into the mould they themselves want to impose. Thus our minds work by way of selection and exclusion. We notice those things agreeable to our pre-conceptions; we deny or distort those things that threaten to throw our lives into disarray. From a deeper, more comprehensive, understanding, the sense of security we ordinarily enjoy is now seen as a false security, sustained by unawareness and the mind’s capacity for self-delusion. Our position appears impregnable only because of the limitations and distortions of our outlook. The real way to safety, however, lies through correct insight, not through wishful thinking. To reach beyond fear and danger we must sharpen and widen our vision. We have to pierce through the deceptions that lull us into a comfortable complacency, to take a straight look down into the depths of our existence, without turning away uneasily or running after distractions. It then becomes increasingly clear that our lives are full of distractions and attachments that threaten to lead us from our path. In the words of the Buddha we are like a traveler passing through a thick forest bordered by a swamp and precipice; like a man swept away by a stream seeking safety by clutching at reeds; like a sailor crossing a turbulent ocean; or like a man pursued by venomous snakes and murderous enemies. The dangers to which we are exposed may not always be immediately evident to us. Very often they are subtle and difficult to detect. But though we may not see them straightaway, the plain fact remains that they are there all the same. If we wish to get free from them we must first make the effort to recognize them for what they are. This, however, calls for courage and determination. 1. The dangers pertaining to the present life. 2. Those pertaining to future lives. A. The objective aspect which is a particular feature of the world. B. The subjective aspect which is a corresponding feature of our mental constitution. What happens in the vow of refuge ceremony? You are directed to offer three prostrations to the Three Jewels with a feeling of faith, confidence and trust, seeking refuge in them. You are then directed to sit with both knees on the ground and the hands joined together, the joined hands denote respect, the bent knee our deep sincerity. 3. Third repetition: acceptance of vow. The support and instruction of the priest that is formally made within the intention of refuge as well as an acknowledgement between the priest and you of the commitment to follow the priest teachings, deepen your study, and dedicate yourself to practice. Your vow is confirmed by receiving a blessing of water on your head and by the cutting of a lock of hair. This simple act of placing water on your head is to signify a new life and purification, a reminder of having taken refuge, and serves as inspiration. The cutting of the hair symbolizes Buddha Shakyamuni’s determination in turning away from the distractions of ordinary life. It derives from his cutting his hair near a stupa shortly after he left the palace and entered the way of the religious mendicant. Throughout this ceremony I will instruct you in the commitments of the ceremony, explain the benefits of taking the vow, and pray for your growth through study and practice. The next step in your Buddhist practice and study is the study and taking of the precepts. The Buddha’s first advice, the first medicine to take to soothe your ills, is to train yourself in the five precepts. Therefore, with a joyful heart that seeks happiness for myself and others, today I will commit myself to follow some or all of those precepts. From my own experience and examination, I know that harming others, specifically taking their lives, harms myself and others. Therefore, I undertake to protect life and to avoid killing. By my doing this, all beings will feel safe around me and peace in the world will be enhanced. From my own experience and examination, I know that taking things that have not been given to me harms myself and others. Therefore, I undertake to respect and protect others’ property and to avoid stealing or taking what has not been freely given. By my doing this, all beings can be secure around me and harmony and generosity in society will increase. From my own experience and examination, I know that engaging in unwise sexual behavior harms myself and others. Therefore, I undertake to respect my own and others’ bodies, to use my sexuality wisely and kindly, and to avoid sexual expression which could harm others or myself physically or mentally. By my doing this, all beings will be able to relate to me honestly and with trust, and mutual respect among people will ensue. From my own experience and examination, I know that saying untrue things for the sake of personal gain harms myself and others. Therefore, I undertake to speak truthfully and to avoid lying or deceiving others. By my doing this, all beings can trust my words and friendship among people will increase. From my own experience and examination, I know that taking intoxicants harms myself and others. Therefore, I undertake to avoid taking intoxicating substances–alcohol, recreational drugs and tobacco–and to keep my body and environment clean. By my doing this, my mindfulness and introspective alertness will increase, my mind will be clearer, and my actions will be thoughtful and considerate. The precepts allow us to understand that by having previously wandered in confusion and used misdirected methods in an attempt to be happy, today I am delighted to choose to live in accord with these wise guidelines of the Buddha. Remembering that the Buddhas, bodhisattvas and arhats–those beings I admire so much–have also followed these guidelines, I too will enter the path to liberation and enlightenment just as they have done. May all beings throughout infinite space reap the benefits of my living in accord with the precepts! May I become a fully enlightened Buddha for the benefit of all! Different precepts offered. Additional precepts can be made according to the practitioner’s personal practice. to abstain from taking life. to abstain from taking what is not given. to abstain from sexual misconduct. to abstain from false speech. Uposatha Observance Days “”the cleansing of the defiled mind and rededicating ourselves to our practice,” resulting in inner calm and joy. Rokusai nichi (六斎日 Six Days of Fasting) observed on the 8th, 14th, 15th, 23rd and final two days of each lunar month. In the West, the Sabbath — either Saturday or Sunday — has been normally the special religious observance day of the week. In Buddhism, which continues to follow the traditional lunar calendar, the day set apart for special religious observance is the fortnightly day of the full and new moons, with the quarter moon days in between. These full and new-moon days, called Uposatha Days, are when the priests gather to listen to a recitation of their precepts and to rededicate themselves to their practice. The weekly observance day on the quarter-moon day is when lay devotees gather in the local monastery to observe precepts more strictly and listen to and speak about Dharma. The basic, minimum standard of precepts for practicing lay Buddhists is the Five Precepts. (Such lay people who are following the Buddha’s Teaching are know as upaasaka (male) and upaasikaa (female)). However, on the observance day (or other special occasion), they may decide to train under the Eight Precepts, which brings them closer to how the monk or nun practices and confess any transgressions they may have committed. This may entail spending the whole day and evening at the temple reading and studying with the priests or individual practice as set forth by their teacher. In our temple we recite and participate in the Hokke Sembo practice. The other day we participate in the Raihai Seiten (Reidan Karmic Attonement Service). We regularly observe Ryaku Fusatsu —Ryaku means “abbreviated observation,” not full observation, take place on the 15th and last day of the month for this practice. to abstain from intoxicants causing heedlessness. to abstain from broadcasting the faults of the assembly. to abstain from praising oneself and disparaging others. to abstain from stinginess and abuse. to abstain from anger and resentment. to abstain from slandering the Triple Jewel. In Nichiren Buddhism, the most important precept that we are able to take, is the Diamond Chalice Precept. That is to uphold the “Lotus Sutra” with our whole body in word and deed. It is stated in the sutra that if one upholds the true Dharma it is the same as observing all the precepts and receiving all the wisdom imparted from the Buddha. One aspect of the ceremony of receiving the precepts is the taking of a Buddhist name that is written onto a formal garment called a wagesa. The Buddhist name is derived from your birth name together with a vision of the goal of your practice; this is seen as encouragement or a goal. Your Buddhist name, although it is not secret, is written on the cloth inside; so as to wear it next to your heart. The wagesa is worn over your left shoulder across your chest. Many people purchase their wagesa, or if they wish they can sew it following a special pattern and ancient custom. Receiving the temporary Mandala is an important step in your path to studying Nichiren Shu Buddhism. This is an ofuda talisman to support you in the beginning stages of their practice of the Lotus Sutra. We should understand that the study of the Lotus Sutra is a major step in the Buddhist practice as it contains the Buddha’s true mind and allows us to understand the teachings from all teachers and sutras. A request should be made to the head priest, in which he will discuss your wish and practice. The minimum period in our temple is 6 months and requires a constant effort as well as attending lectures in basic and beginning Buddhism offered at the temple. Receiving the Shutei Mandala Gohonzon is the most important step in ones Nichiren Shu Buddhist path. This ceremony symbolizes that you are a direct student in the lineage of all the great masters of India, China, Korea, and Japan through the lineage of our founder Nichiren Shonin. Each Mandala Gohonzon is specially prepared by the teacher transmitting their lineage as well from the disciples of Nichiren Shonin through to you. It also connects you to the sacred places of the Eternal Buddha and Lotus Sutra. From Mt. Sacred Eagle in India, Mt. Tien Tai in China, Mt. Minobu in Japan (where Nichiren Shonin lived), to your home temple in Japan, and finally to your temple in the States. As you can see it is a spiritual object as well as a lineage chart from the Buddha to you. This process is very important and may take time. All is up to the idea of your teacher who will see your deep faith and practice. The lay members of Buddhism are the same as during Shakyamuni Buddha’s time in that they practice the Dharma in their daily lives as householders and it is believed in Nichiren Shu Buddhism that they can also progress in their role in the Sangha as students of Buddhism according to their dedication and practice. In all traditions of Buddhism the lay persons are considered deeply important in that they give material support to temples and by their daily work provide the economic foundation for the teaching and practice of Buddhism to continue. They also participate in such activities as festivals, ceremonies and pilgrimage. Membership is seen as the ultimate commitment to fulfilling the great vow of “Saving all Sentient beings, however numerous they may be.” As a small temple, Choeizan Enkyoji relies on members to support our sangha and to carry out much of the work required to help accomplish our mission to have as many people meet the Lotus Sutra as possible. It’s a life changing decision that takes hard work—but it’s also the most rewarding work in ones practice of the Dharma. The head priest and elected board members of Choeizan Enkyoji strive to love and care for its members well. In turn, we rely on our members to accomplish our collective work as a temple. As an organization, we operate with minimal staff, budget, and programming because we trust the Lotus Sutra to move through the positive and compassionate hearts of our members, mobilizing the collective body of Buddhism in humble ways to compassionately support our city, love our family, and practice Buddhism in our daily lives. If you’re desiring to make a deeper commitment to Choeizan Enkyoji Temple, we encourage you to become a member. Follow the steps listed here to get the process started. Attend services on regular basis. Join a community group such as the Dharma School or Lay Leaders. Volunteer to help with events, clean and maintain our space, and support temple project committees. Support the temple by donations and membership. Our members are diligent in practicing Buddhist and to have received the temporary Mandala . Our temple offers an introduction class to help you understand fully who we are as a temple, what we believe, and how we operate. It’s also a great chance to meet others and get to know your leaders. We believe it’s important to know these things so that you can make an informed decision about membership. Contact our Temple to find out when they’ll be holding the next Doctrine class by looking at our website calendar. Choeizan Enkyoji Temple members share in their dedication to the temple by supporting the direction of Nichiren Shu, joyfully living in our community, supporting the temple, observing ancestors’ memorial days, maintaining a Buddhist home, and giving faithfully. As the final step in membership, you’ll meet with our head priest or appointed representative for a final membership interview. This is an opportunity to confirm your commitment and ask any questions before being installed as a member by the board of directors. Receiving a Dharma name is a significant marker of one’s practice. A Dharma name is a great honor and tool to develop ones practice. Other reasons exist such as a devout layperson who has contributed much time and effort to the temple. There are many reasons and events for receiving such a name. Most importantly, please request this from a certified teacher. A name given or made incorrectly can influence our practice in many ways and using kanji characters meanings change according to the context. The Dharma name is tailor-made and reflects the teacher’s lineage and his wish for the students practice and study. If one wishes to become a priest the first kanji character will be the same as the teacher’s lineage and the second will be a sound from ones birth name as well as the teachers intended goal for the student. In the case that a lay person has a lay Buddhist name, a new priest name may be given or the last kanji character may change. At the time of one’s death a longer Dharma name called a Kaimyo (Posthumous Buddhist name) will be combined with one’s Dharma name received earlier during one’s life. If one did not receive a Dharma name during one’s life, a new name will be incorporated with the Kaimyo that will be given. This Kaimyo name, composed of kanji characters, allows us to see the person’s interests and reflects their life and Buddhist practice. This ceremony is a private ceremony in which a practitioner formally asks a teacher to become his student. The ceremony is short and normally takes place in the interview room. It marks a mutual commitment between the two. The student will not always be accepted and may have to ask more than once. It is important to reflect on why you want to form this relationship and what, for you, it implies both for yourself and the teacher. This request is always left to the students to initiate. The teacher’s job is to allow the students to develop and mature along the Buddhist path and to provide a vehicle for spiritual and psychological development. Basically the teacher ‘holds the seat’ for the students. The students commits to walking their own path, step by step, and accepting full responsibility for their own actions. ‘Entering the Way’ intrinsically involves, for all of us, change and especially personal change. This will for most people, at some point, lead to resistance to that change and a possible, potentially difficult, relationship between student and teacher. This agreement carries with it the understanding on both sides to allow this process, if it arises, to happen and to clarify it without (or before) walking away. On a personal level, if somebody asks me this and I agree then there are certain general expectations I will have of that person. I would want them to support the sangha and to occasionally do some physical work e.g. in maintaining the temple, preparing equipment for service and meditation, helping in the making of mats and cushions. Or I would want them to support the sangha in other ways, such as administrative work, helping with the website, accounts, charity status etc. I would expect them to attend the temple at least once a week ( if they live in Seattle), to see me in interview at least once a month, preferably more, to do an absolute minimum of one extensive practice a year and one retreat at our temple. I may also ask a practitioner in an explicit or implicit way to take on a task or change their behavior towards a particular situation in some way and part of the practice is to pick up on that without it being spelled out. A lay leader is a very important spiritual step for a Nichiren Shu practitioner. It is a very deep formal commitment to both one’s own personal practice as well as in supporting the temple and its members. The training course is a very in-depth study of the temple’s traditions and practices, and therefore may vary according to each temple and its chief priest. Basic skills include running programs, office work, learning to perform basic services (to assist the priests of the temple), helping in educating lay members, caring and administrating for the temple and activities. This is a very important and serious commitment to training and practice. If you are interested, please schedule a meeting with the chief priest of your temple to discuss your wishes and to understand what will be required of you. This training is the last step before becoming a Shami novice priest. 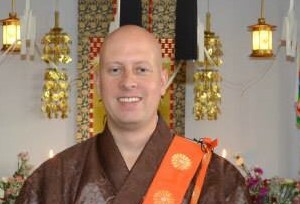 Apostolates usually wear a white hakue robe for services and events. This period is up to the instructing teacher and is based on the student’s progress and dedication to their practice and study. The path to becoming a shami in our temple is a very long and committed path of study and practice. The path begins with making known your wish to your teacher. At that time the teacher will explain the meaning and requirements both of the order and himself. Many people do not fully understand both the time and effort that is required. At that time the teacher may request a formal agreement between teacher and student. If the student is not ready the teacher may request that they devote themselves more deeply as a lay person before they will formally accept them as students. A student should understand the responsibility on both ends of this agreement and the time restraints and cost requirements. This training period is determined by the chief priest and is not based on a specific time. My training took 10 years from beginning to end. If you are accepted, a Tokudo ceremony will be scheduled for your home temple. During this ceremony your family attends and supports you in leaving the laity and becoming a novice priest under the direction of your teacher. Traditionally, at this time you are required to leave your home and family in your practice. Your hair is cut and robes are given. This ceremony is very special and may be different according to each temple’s tradition. After you have trained for about one year the next step is to take the Docho ceremony in Japan, which is offered a few times a year at Seichoji Temple in Chiba prefecture. This is where Nichiren Shonin took his Tokudo ceremony from his teacher, Dozenbo Shonin. After this step there are multiple times you are required to visit and study in Japan. The whole process depends on the teacher’s discretion. Training in our temple can take up to ten years of study under your teacher. As you can see this is a lifelong commitment and cannot be taken lightly. Once the teacher has watched you grow for many years and is satisfied with you understanding and practice, he may feel that you are ready for the final practice in you ordination. You are then ready to attend Shingyo Dojo, which is a 35 day practice and study for Shamis. Once this is completed the relationship between student and teacher changes and moves to a new level of practice and study. Once again a large cost is associated with this decision so you should be prepared to do as requested by your teacher.